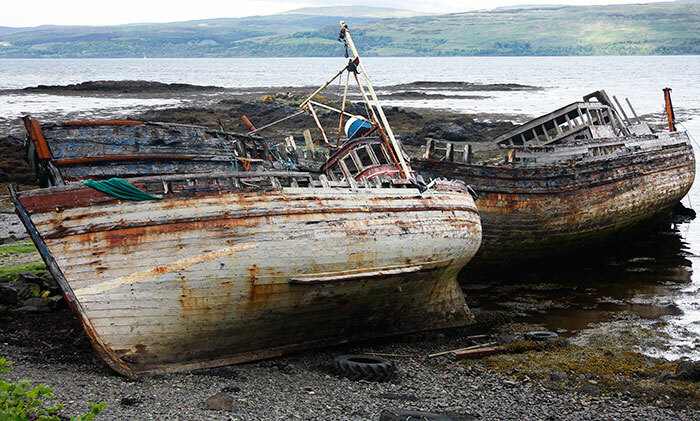 Beached at a low jetty's shoreward end these three wooden fishing boats are a decaying record of once common sights and skills on the west coast of Scotland. 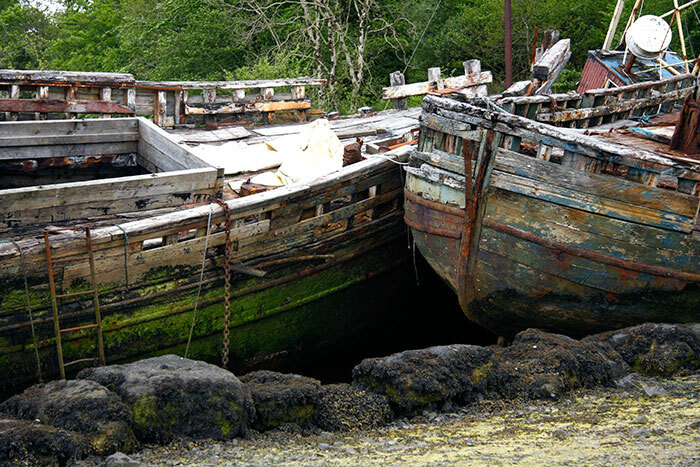 I did see one beautifully varnished working example in Oban harbour on the day I made these photographs on Mull. There are still yards with carpentry skills capable of maintenance and repair but perhaps very few able to undertake new construction. It's sad to see these three beyond hope of restoration and conversion to embark on a new life and to retain links with the past. 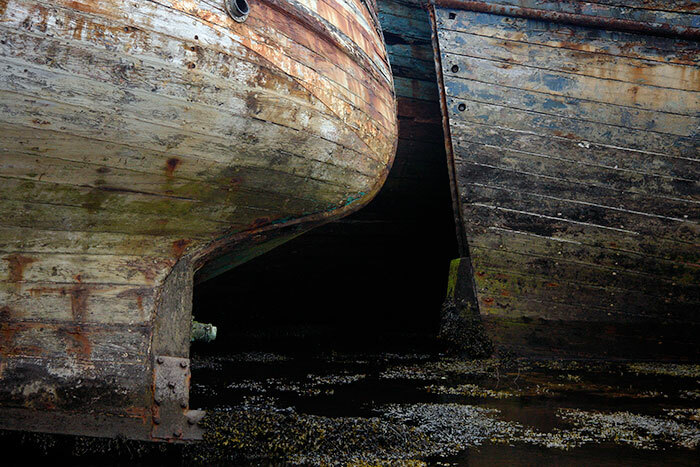 One boat rests against the pier and supports its leaning companion. I tilted the camera to adjust the relationship of the hull's curving flair to the picture frame which also tilted the boat prow angles a little more to the left. I also wanted to eliminate any intrusion of bright white sky into the composition even if that meant inclining the invisible horizon line beyond the rippled water. 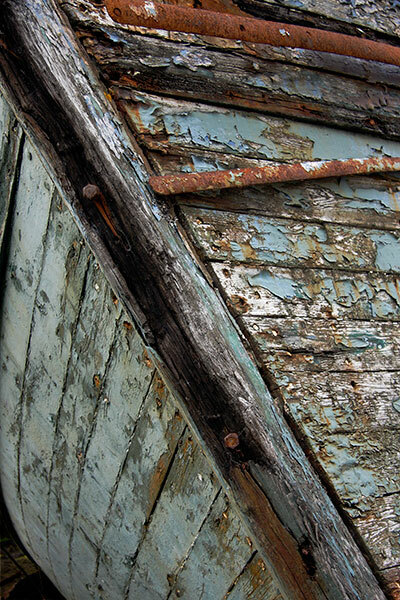 The composition also contrasted the differing contours and forms of the bow timbers worked by the shipbuilders. At the time I wrote these notes this was the composition that held the most appeal although I'd rather the erratic plank had not been there. 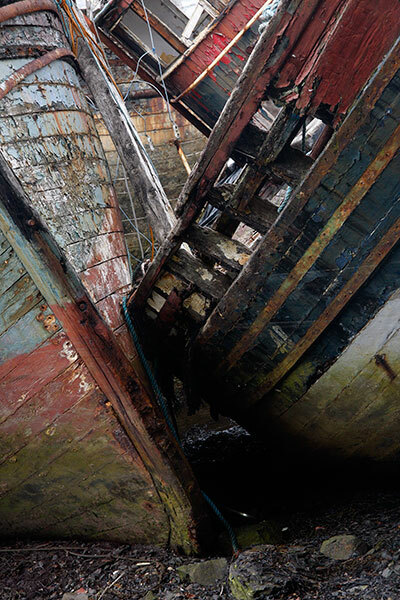 The close proximity to the three hulls, the contrasting angles of their strong linear elements and the fading textured colours they enclosed prompted similar variations on the theme. Cutting, shaping, jointing and assembling the frames of the hull’s keel, ribs and planking must be complex carpentry. Water soaking and heating is crucial to twisting the profile of each wood strake to fit into its exact position on the frames: wooden treenails or metal alternatives hold them in place. Treenails function like dowels furniture or the frames of a wooden building. In a boat, water absorption tightens the bond between peg, plank and frames. 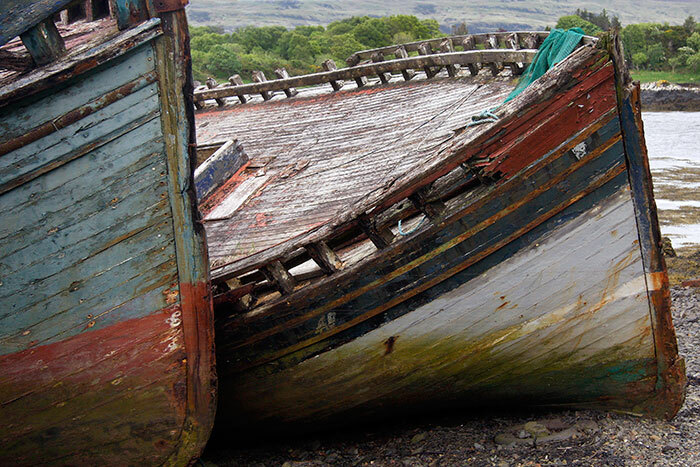 The stem timber of the right boat is missing, leaving visible the outline of the wooden knee that links it to the keel. This wider view of the hull shows the joints between the sawn ends of strake sections and the opening up of their seams. 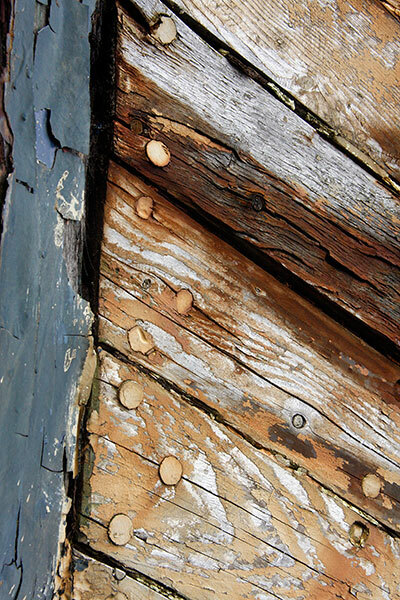 A surviving length of an iron rubbing strip and marks left on the timber by others contribute. 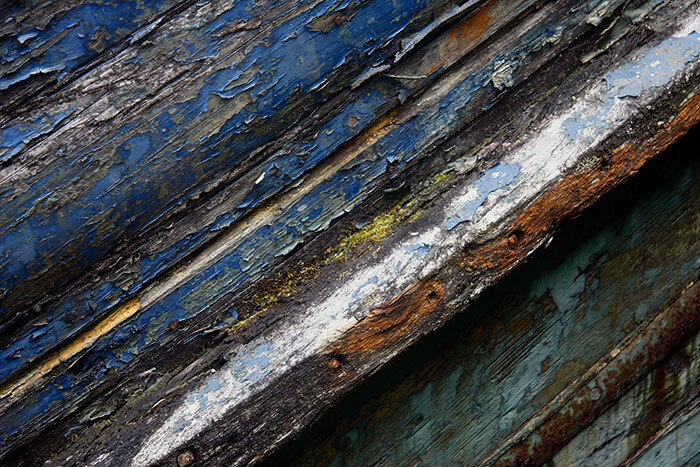 I liked the rich colours and textures on the hull and regret that the tide was too high for me to walk out further from the beach to photograph it and the third boat in detail. Walking boots aren't effective in six and more inches of water and a bus timetable denied a wait for low tide. The paint is almost completely weathered away to leave the grain of the wood in light relief: the thicker pigment on the cheat line has fared better. 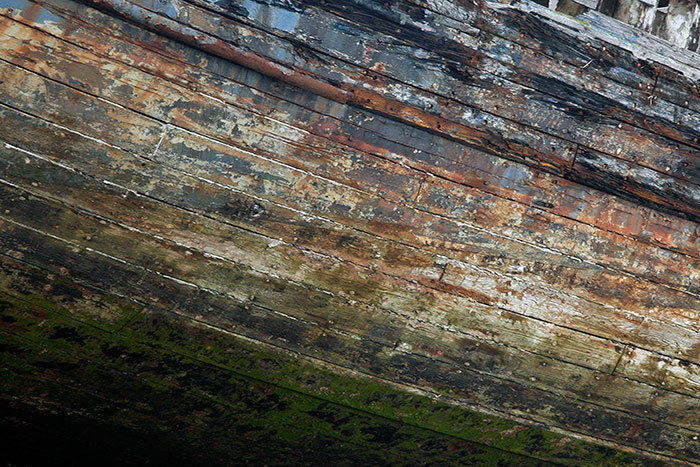 Rust patches suggest that iron nails were used to fix the planking to the rib structure beneath. Caulking seals and waterproofs gaps in planking on hull and deck. Materials such as hemp, cotton and synthetic fibres, pine tar, linseed oil based putty and synthetic sealants are packed into the seams using a paying iron and mallet or other method. 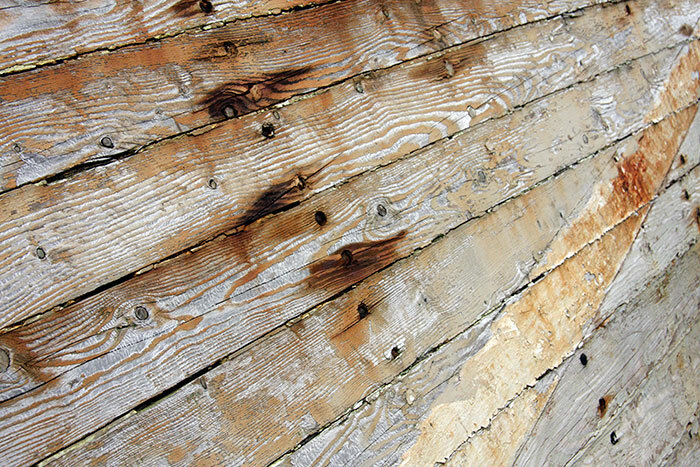 The ends of the hull planks are fixed flush into a rebate cut into the back of the stem: the caulking and the disintegrating wood belie the original fine craftsmanship. A putty compound appears to have been used as a final strake caulking sealant and as plugs to cover the recessed nail heads. The vocabulary and listing of parts in wooden boatbuilding are comprehensive and difficult to grasp without a boat to examine: I'm not sufficiently qualified to use any more than the very basic terms. Here, the stem timber is joined to the keel running the length of the hull. Braced by other timbers and the main frames of the boat this curved junction of the two is protected by iron work bolted into place. The bright bolt heads suggest stainless steel and I've since speculated about the time lapse since they were tightened into place. 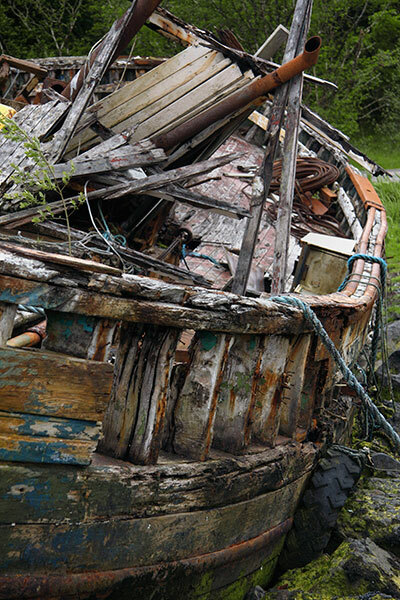 I wanted to scrutinise the linear joints of the carvel-built hull, the flaking paint, springing and rusting iron rubbing strips and the physical disintegration of the wood itself. This and many of the other images I made could provide starting points for a series of paintings in their own right. I thought briefly about how smooth and beautifully finished this prow would have appeared had I been photographing the new and unpainted stem in the boatyard. Contrasts in hull size and proportion show in this image of the two bow sections. Would the two boats handle with any marked differences? The sharper profile to the left may have aided speed whilst the more blunt form of the other might have been an asset in heavy seas. 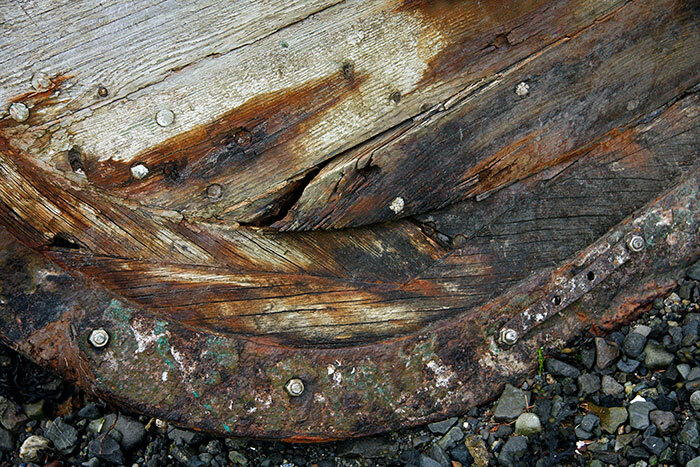 This image records a fragment of the boat's starboard gunwale towards the bow. The weathering of timber and its coats of paint, diagonal lines and a liking for abstract expressionist paintings underpin this composition. 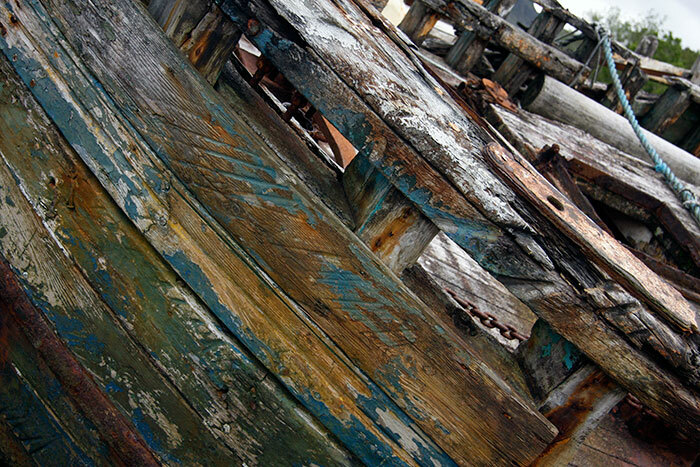 I liked the deep blue paint peeling and flaking away to expose the greys of the underlying paint and wood grain. A flash of yellow hints at a once bright line added to decorate and enhance the overall colour design on hull and deckhouses. 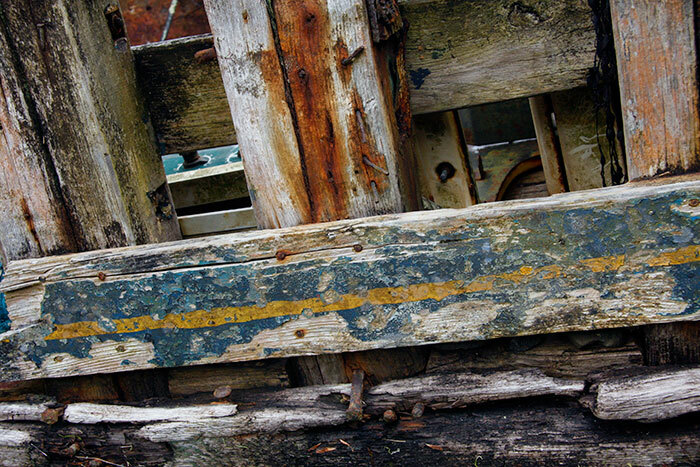 Further towards the stern lengths of the gunwale planking has gone, revealing the frames beneath and some of the ironwork that held it in place. 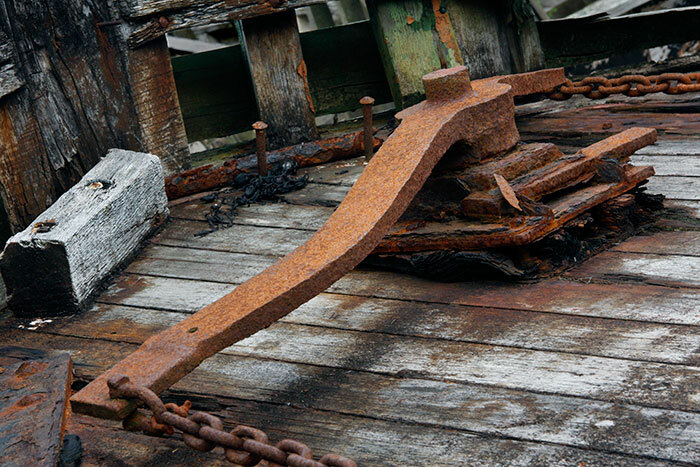 Connected to the rudder below the stern, the wrought iron crossbar of the rudderpost is linked by chains to the wheelhouse. Like ship's carpenters, traditional blacksmiths must be increasingly rare. The design, measuring, cutting and forming of these sharply curved planks would be fascinating to watch. I find cutting and planing straight timbers exacting enough without adding the water soaking and heat required in reshaping them. Looking along the starboard side shows something of the boat's frames and the curvature of the deck between bow and stern. 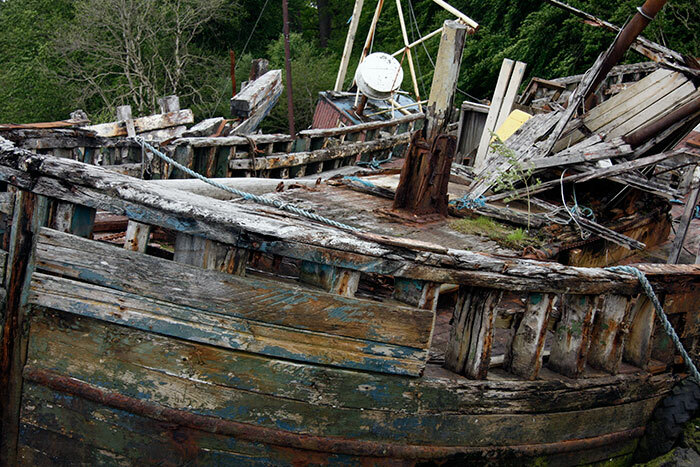 There is marked deterioration in all three boats since I first saw them when this wheelhouse was intact and roofed. Metal parts and timber are being removed and I'm pleased to have been able to photograph around the pier before further decay and damage. I worked fairly systematically from the boats' port sides, across the bows and down to their sterns before seeking less ordered additional images. They are arranged to display what it was like to walk around them although tide levels prevented a full circuit. I had about ninety minutes in which to work before walking away to catch a service bus that passes nearby. I worked without a tripod, recognising that the images could be less sharp than best possible. 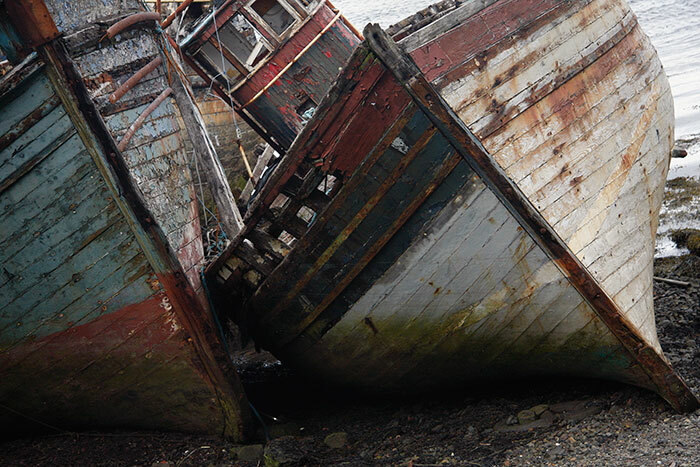 However, I wanted to work quickly on a descriptive collection that observed the structural forms of the boats and their ongoing weathering and decay. Another photographer appeared to demonstrate how it should be done, working slowly with a tripod whilst, exploring compositions and paying close attention to the quality of light for what seemed to be a single shot. 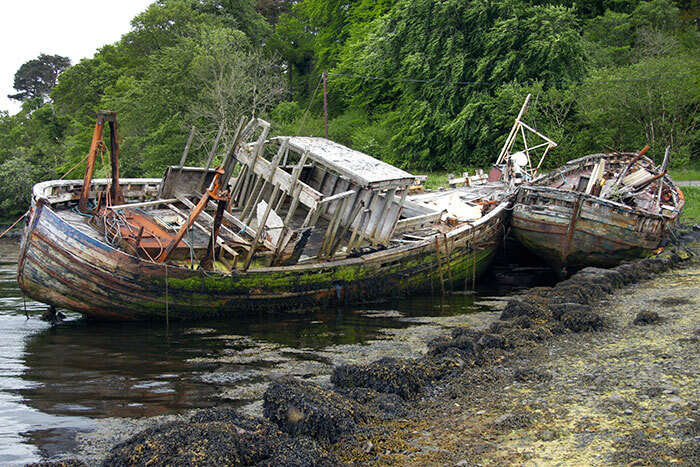 The mainland and island coast between Crinan and Skye are incredibly varied, often dramatic and always worth exploring. The weather echoes in its variety. On this trip I had grey days that sapped colour, some rain and occasional blue skies. Large islands such as Mull and the small like Iona can be reached by ferry, with buses and trains providing a good framework for car-free exploration as I realised on this visit. Beached and derelict boats and wrecks can materialise as if from nowhere as these did: I'd like to photograph more of them.